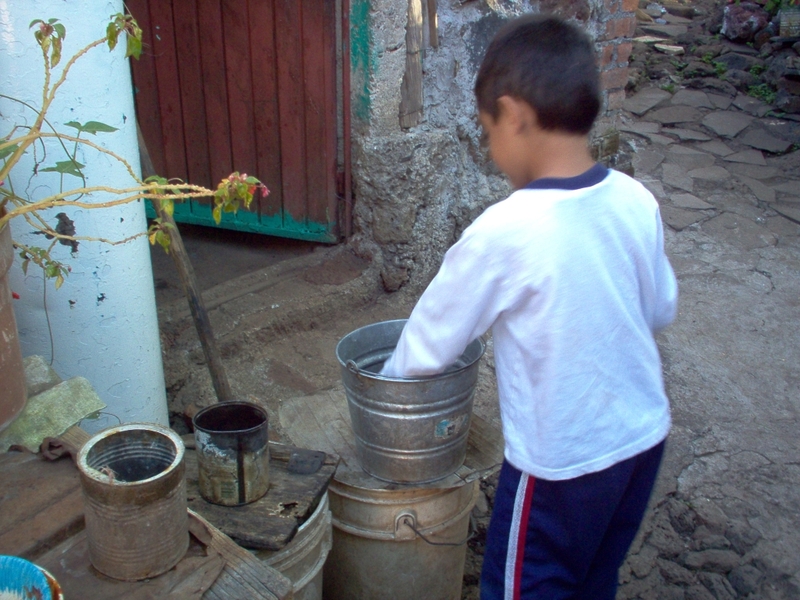 As La Yacata does not have any water lines, nor sewer, nor electricity, daily living is challenging some days. Not having electricity requires that we make daily trips to town and buy just enough perishable foodstuff that we would eat in a day, and have the same thing for both lunch and dinner. Any organic scraps go to our animals. Nothing wasted. For lighting, we do what we can during the day and use a candle when it’s dark. For the most part, we rise and roost the same time as our chickens. But not having water is much more difficult. We have an ajibe (dry well) that can hold about 3000 liters of water. 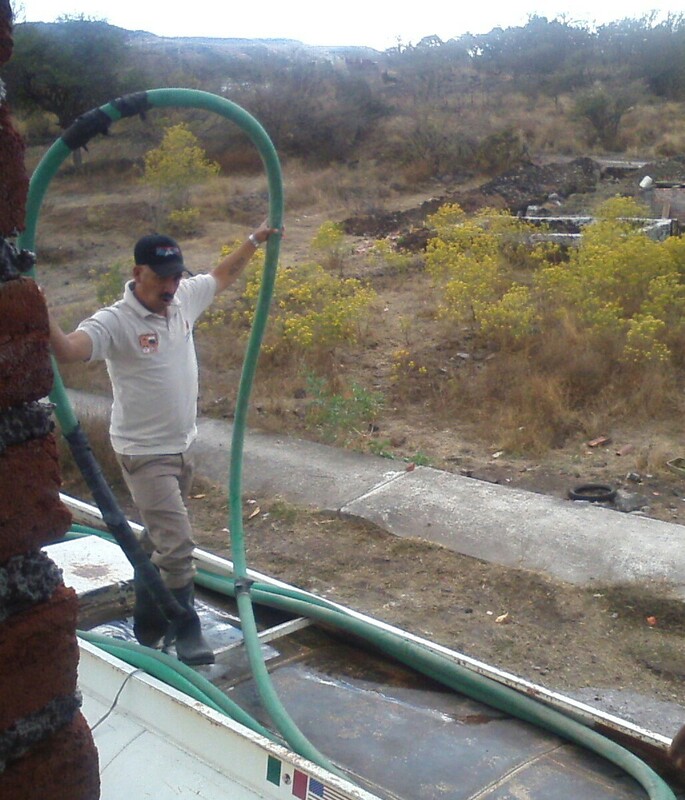 Then we have a tinaco (water tank) on the roof that holds another 1500 liters. And recently we bought another water tank to hold the animals’ water. This amount of water will last us about 2 months. 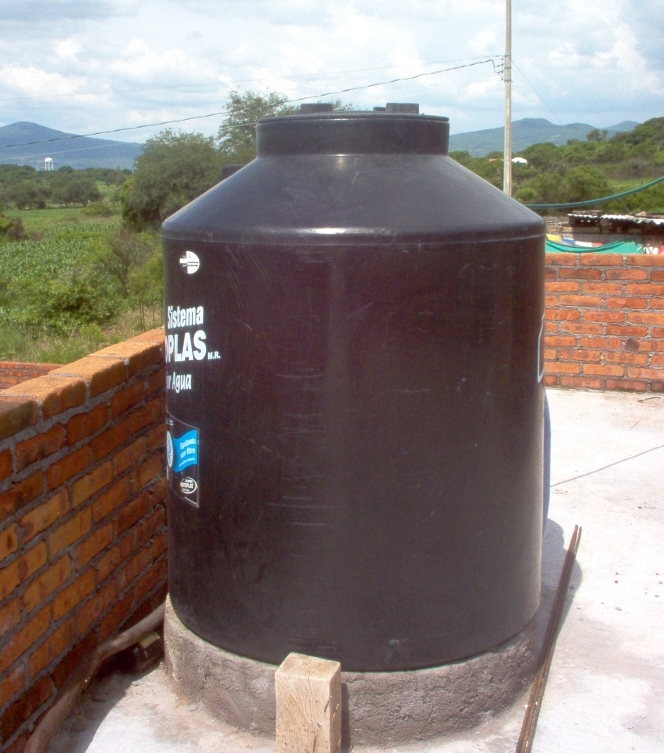 Our tinaco (water storage tank) on the roof of the house provides us with water for the kitchen sink, toilet, bathroom sink, and shower. The rainy season begins in June and lasts until about the end of September. During the rainy season, there isn’t a shortage of water. We catch the rain in barricas (barrels), even been known to hang the blankets out for a little rain washing. The trick is then to get them dry. 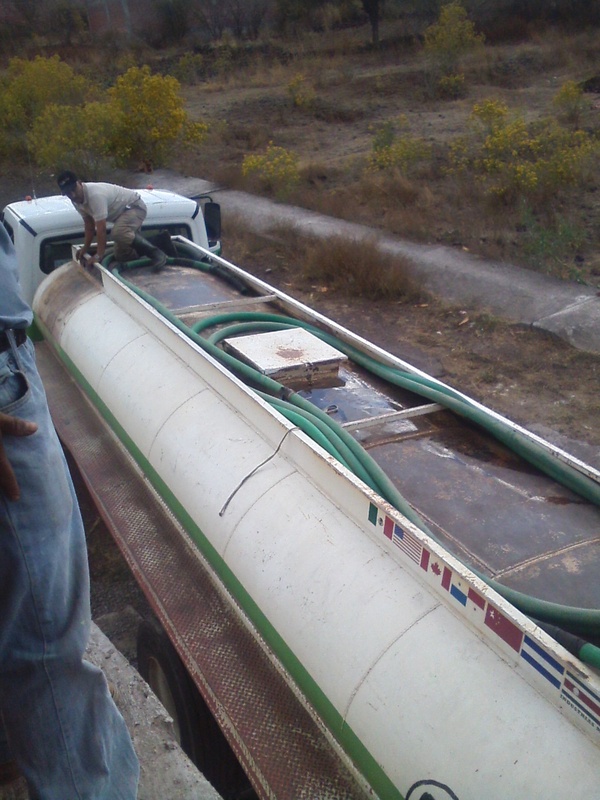 For about 400 pesos, we can have a tanker truck full of water delivered to our house. But during the dry season, water is a problem. During the last president of Moroleón’s term, the local pozo (well) at Los Areas Verdes refused to provide us with water saying that the well was drying up. However, the tanker trucks that arrived daily and left full told a different story. I’m sure they paid more than the poor people in La Yacata. For awhile, Los Areas Verdes was charging us 50 pesos per barrica (barrel). So we had to look for alternatives. The truck pulls in front of our house and we run a house from the truck to the ajibe and tinacos. We ordered a tanker of water directly from the bomberos (fire company), however they charged us for 10,000 liters but only left 7,000. 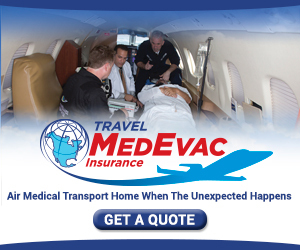 When we pointed out the discrepancy we were blacklisted and now no delivery to La Yacata. Filling the water storage container. Another of our solutions was to go to a little community called Ojo de Agua de en Medio. As its name implies, there is a natural spring in the center of town. A section of the spring has been diverted into a public trough, used for water livestock and washing clothes. The water then runs into a sewer canal. So we loaded up the tank in the truck and off we went. We used a bucket fire brigade line to fill the tinaco (water storage tank) and barricas (barrels) and headed back home. As our ajibe (dry well) is the rear of the house, we had to poke a hole in the wall to run the pipe in. 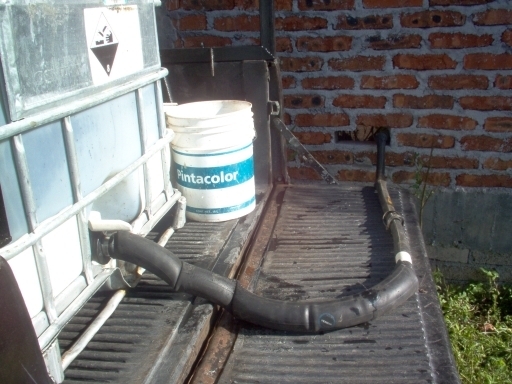 My creative husband used an old bicycle inner tube to connect the tinaco (water storage tank) to the pipe and let gravity do the rest. As you can see, the process of getting water is not just a simple matter of turning on the faucet. Therefore, we respect each and every drop. This requires adapting how we used to do things. For instance, in order to wash dishes, we employ what is called “drought washing.” Dirty dishes are stacked to the side. The sponge is soaped up. The dishes are soaped up. Then they are rinsed. No sink full of water for us. My husband’s grandparents, being in their late 80s, have even more difficulty in obtaining water. So doing dishes at their house is more of bucket washing. Minimal water is used. The dirty water then goes to water the myriads of plants they grow. Not a drop wasted. Under the plants in the background is their ajibe (dry well). I’m pretty sure the same water has been there since the dawn of time. Bathing uses quite a bit of water. We have a small gas boila (water heater) that provides the luxury of a nice hot shower. In order to both save gas and water, we schedule our showers so that we only have to light the water heater once. As one member finishes, the next jumps right in. When everyone is squeaky clean, we turn off the boila (water heater). Our animals are also limited to the amount of water they use. Each corral has a container for fresh water, but it the container is no bigger than the animals need. For instance, the goats have a receptacle that will hold one bucket of water. Since they won’t drink water that seems dirty to them (has grass bits in it) we reduced the amount of water wasted when we cleaned out their bowl. The rabbits have an even smaller water dish, again with the idea to minimize waste. So even though all our animals have fresh water daily, we try to keep the water waste low. 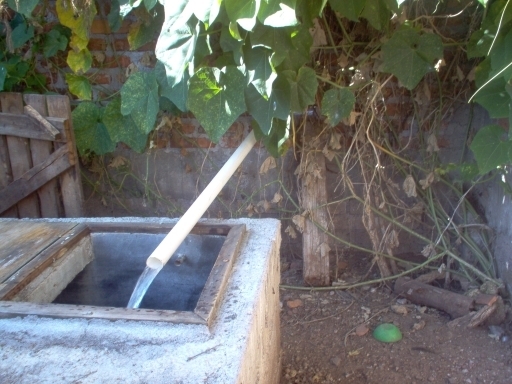 Additionally, the dirty water from the animals is used to water our fruit trees in the back. Waste not, want not. I could say that housecleaning too is diminished due to lack of water, but honestly, I didn’t do much of that even when we lived in the States. Our house is clean, but not spotless. I mop the entire house only once a week, then toss the water on the trees. I clean surfaces as they need it, not as a part of a daily ritual. We’re good with that.